豆科 Leguminosae | | 苜蓿属 Medicago | | 花苜蓿 Medicago ruthenica (L.) Trautv. 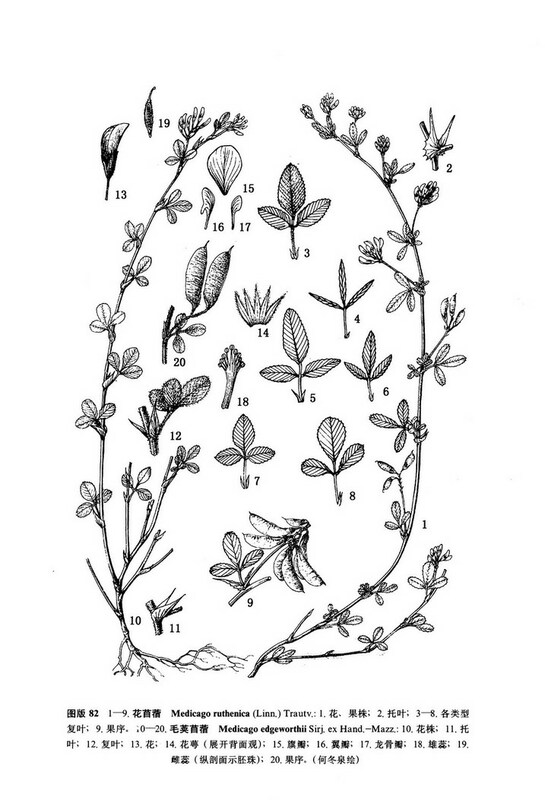 Medicago ruthenica (Linn.) Trautv. in Bull. Acad. Sci. Petersb. 8: 270. 1841; Franch. Fl. David. 1: 80. 1884.——Trigonella ruthenica Linn. Sp. Pl. 776. 1753; Grossh. in Kom. Fl. URSS 11: 127. 1945; Vass. in Acta Inst. Bot. Acad. Sci. URSS ser. l, 10: 169. 1953; 中国主要植物图说•豆科189. 1955.------Pocockia ruthenica (Linn.) Boiss. Fl. Orient. 2: 90. 1872; 内蒙古植物志3: 146. 1978.——Melissitus ruthenicus (Linn.) Latsch. in Not. Syst. (Tbilisi) 32: 21. 1976.——Melilotoides ruthenica (Linn.) Sojak in Acta Mus. Nat. Pragae 38: 104. 1982; Yakovl. Pl. Asia. Centr. 8a: 88. 1988.——Trigonella korshinskii Grossh. in Kom. Fl. URSS 11: 127. 1945.——T. schischkinii Vass. in Bot. Mat. Herb. Inst. Bot. Acad. Sci. URSS 14: 232. 1951.——Trigonella emodi auct. non Benth: 中国主要植物图说•豆科191. 1955.